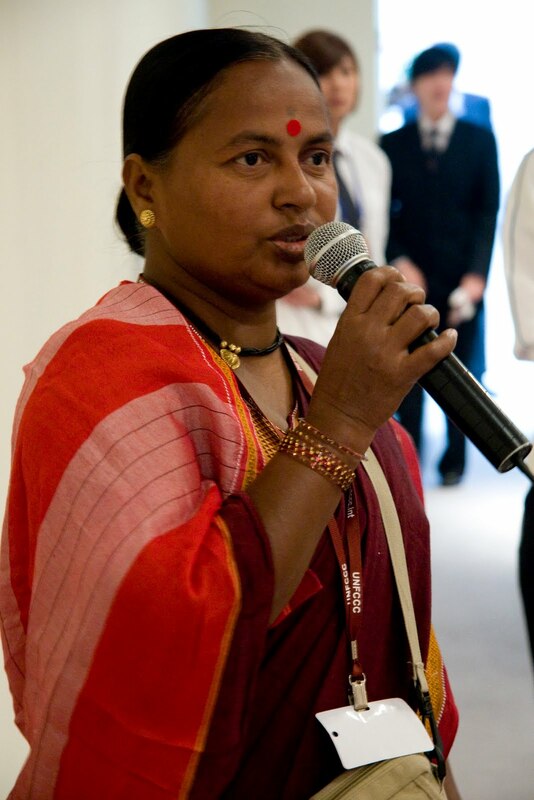 Sushila Sable has represented waste pickers at two international climate conferences - in Copenhagen in December 2009 and in Tianjin China in October 2010. In this post written by Maitreyi Shankar , Sushila speaks about the experience of traveling abroad for the first time and how it feels to represent waste pickers globally. As I stepped into the aircraft, I could hear my heart pounding. With each step down the aisle, I was reminded of everything I had to go through to get the documents that got me onto this flight. The humourous sides—when I mistook a passport for a bank passbook… the long hours I had to wait at the passport office… the explanations… mixed reactions from the family… For a fleeting second, I heard some instrumental music playing somewhere in the background. “Why would someone like you need a tatkal passport?” The tune sounded familiar… It was soon overpowered by the resounding voice of the passport officer—“you have to submit your marriage certificate…Or at least a photograph of the two of you together taken at the time of your wedding.” I was livid that I needed this sanction to travel abroad; the sanction of a man whom I had not met in the past 25 years… a man who had thrown his pregnant wife out of the house a few months after the wedding. I could live with the idea of not travelling abroad but not with the humiliation of having to ask him for photographs and certificates of a time I did not want to remember. A well meaning official in the bureaucracy got my passport through. A smiling airhostess guided me to my seat. I sat down and fumbled with the seat belt, displaying both nerves and my unfamiliarity with the situation. A kind co- passenger helped me buckle up and told me I could ask him for anything on the way. Jyotitai’s son had made me many placards—all bilingual—to be used during my flight. I was relieved that I might not have to use those cards anymore. As the plane started to move, my throat felt dry. I had a funny feeling in my stomach. I suddenly realized that we weren’t on the ground anymore. Airborne, I looked down to see the blue plastic sheets characteristic of slum roofing in Mumbai. I took a deep breath. Suddenly I spotted a familiar tree, a corner of the street and a pile of sacks. It was the place where I used to sort waste for many years. I had spent so many hours under that tree looking at aircraft taking off. In those days I used to wonder what it was like to sit in one of them. My eyes welled up with tears. I felt humbled and a sense of extreme pride rush through me. All that happened when I was traveling to Denmark in December 2009. On my second trip abroad to Beijing in 2010, I boarded the aircraft with the comfort of boarding a bus! I was there not only for myself but was representing waste pickers in my country and of the world. I felt this huge responsibility on my shoulders. Language was a barrier. While I heard my colleagues talking to other delegates in English, I regretted never having made it past elementary school. It was good to meet officials from India, because I could speak to them directly in Hindi. I thought the visibility event in Tianjin was excellent. I didn’t realize we had been standing there and singing for two hours. People noticed us and the issue we were there to talk about. One of the most exciting parts was inviting people for our Side Event in Tianjin. “Please come tomorrow”—followed by giggles at the sheer joy of being able to speak in English, albeit three words. The first thing that stuck me about “foreign” was the cold. I wondered how people lived there. The country was well-to-do but I didn’t quite take to the food. Even the bread there tastes different from what we get here in India. When I told my son I would be traveling to Copenhagen, he was thrilled. Before I left, some idle talk about my making this trip made its way to my ears. He told me to ignore it and encouraged me to grab this opportunity. On my return, he was supposed to be there at the airport to receive me. We learnt through a friend of his that he had met with an accident on the way. The cab we were in and the ambulance carrying him arrived at the hospital at the same time. I feared that people would blame me for this—as if my being so “forward” had caused this. His accident shook me—emotionally and financially. Of course, there are some people who think I get a lot of money for these trips abroad. They assumed it covered the hospital expenses and much more. Some people thought that our organisations were flaunting our poverty for their benefit. I knew and believed otherwise and know that there are many more who think like me. The wonderful part from my travels has been that other waste pickers have started to recognize the value of what they do. None of us really knew that we played such an important part in protecting the environment and mitigating climate change, including me. Travelling to different countries and seeing other places has been a great experience for me. In the past, I didn’t really think about other waste pickers, certainly not those in different countries. Learning about their way of life, their work has been wonderful. Between the two trips, I think I had a better time in China, although there was a lot more happening at the conference in Copenhagen. I was more confident about speaking in public. The opportunity to fly was perhaps the most exciting thing for me. Sushila Sable has been associated with Stree Mukti Sanghatana (SMS) for the last 11 years and is also the president of a Federation of 160 self-help groups of waste pickers in Mumbai, with 1650 members. The Federation is registered with Municipal Corporation of Greater Mumbai and is affiliated with SMS. Apart from working on microfinance the federation has also set up scrap shops with the help of MCGM and also helps members to set up small business ventures. SMS is a feminist organistion working in the city of Mumbai since 1975 and working with waste pickers since 1999 in 4 cities including Mumbai.